How much does food affect our health? And how does traditional medicine work with this relation? From my experience, it is hard to know. We all think we know, but how much does science really know about this? 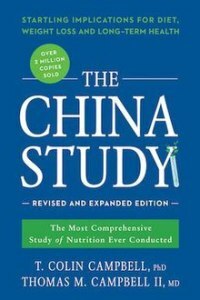 The China Study is a book that deals in the first part with the statistical relation between food and all kind of health problems. And I rewrite statistical because with all the advancements in science and technology we still know very little about how the human body works as a system. The basic conclusion of the book? Eat a whole-grain vegetarian diet and your chances of cancer, heart disease, Alzheimer, dementia, and many others will be drastically reduced. Most of the conclusions come from peer-reviewed research in established and reputable publications (as far as the author states, I didn’t check). The author of the book, T. Colin Campbell is a professor emeritus at Cornell University, with a long publishing track record, and he also cites respected doctors and professionals in many places, which gives much credibility to this book. The second part of the book deals with the politics of nutrition. How doctors that dictate nutrition guidelines for schools, hospitals, and the public in general have interests in industries like the cattle industry or the dairy industry, and how this makes the guideline they write very wrong and biased. “hid” some of the information that did not match his research, and jumped steps in the conclusions he made from the data (For a taste of this, read the Reception section in Wikipedia, or The China Study: Fact or Fallacy which is an article with LOADS of information, correlations, and data-analysis that refute the conclusions of The China Study). This happens a lot in academia, so it would not surprise me if it is true. After having spend a lot of time around doctors, I have to say that even id Prof. Campbell’s studies are not completely true, it is true that doctors put too little focus in nutrition and too much focus on drugs. The best example I have is when my son started eating a lot of carrots (4-5 a day) after half-year of hospitals, IC, and operations. We talked to the doctors about this and they said “watch out, he may get Carotenosis!”… so what is the problem? “He will look Orange!”… ah!, and is this dangerous? “No, definitely no”. So basically the doctor is saying we should lower our child’s carrot consumption because he will turn orange, even though there is no other harm in this. Carrots are a great source of vitamins, so why stop? The viewpoint is very narrow and not system-focused. Very interesting and mind opening reading, which shows once again how hard it is to trust anybody on any subject. And when this happens in relation to health, this is both saddening and troublesome. Ah, and again it is shown how little we still know about the inner workings of the human body. But we are moving forward.